R.E.M. - Remember Every Moment? The name of the rock band from Athens, Georgia is explained pretty much anywhere by referring to the medical term Rapid Eye Movement, the uncontrolled, rapid eye movements that occur when someone is in deep sleep. 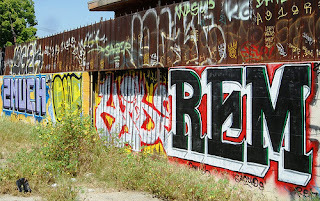 There is however a large contingent of fans that stubbornly holds on to the claim that the name does not mean anything at all: the abbreviation is said to either have been picked at random from a dictionary, or someone chalked the letters on one of the outside walls of a church building used as a rehearsal hole by the future R.E.M. Very cute is the explanation that Michael Stipe learned the abbreviation from his grandma. In this version the little old lady told Michael to enjoy every moment of his life: Remember Every Moment!